OpenOffice is already a complete desktop office suite that is at par in terms of features with the proprietary Microsoft Office. However, its functionality can still be improved by utilizing useful extensions that are easily available. Like in Firefox, OpenOffice will let you install or remove extensions without difficulty with the use of an Extension Manager. This is definitely one of my favorite extensions. 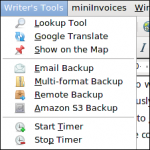 Fully loaded with useful utilities, Writer's Tools is truly a must-have for professional and even for non-professional writers. Some of its impressive features are:Multi-format Backup tool saves the currently opened Writer document in the Word, RTF, and TXT formats. * Email Backup tool can be used to quickly send a backup copy of the currently opened document to a specified email address. * Lookup Tool lets you look up the currently selected word in several online references, including Cambridge Dictionaries, WordNet, and Google Define. * Post to Microblog tool can be used to send messages to the Identi.ca and Twitter microblogging services. This extension makes it possible to check for grammatical and language errors since OpenOffice doesn't have a grammar and language checker by default. It supports languages in English, German, Polish, Dutch, and much more. It is rule-based, which means it will find errors for which a rule is defined in its XML configuration files. Rules for more complicated errors can be written in Java. However, it does not include spell checking. If you want to efficiently reduce the file size of your presentation, then this extension is for you. It can optimize the image quality size and remove data that is no longer needed in your presentation. 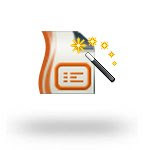 The Sun Presentation Minimizer wizard summarizes all of the changes that will be made to your presentation, and then gives you an estimate of the file size reduction. 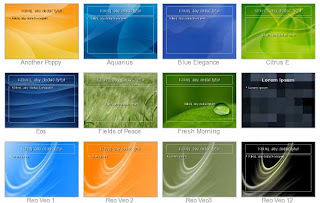 This is simply a collection of 30 beautiful templates that you can use for your presentation to impress your teacher or your boss. The graphics by the way are based on open-source art. After installation, you can access the template by going to File -- > New --> Templates and Documents --> Templates --> My Templates. 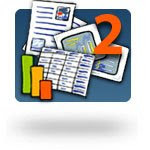 To be able to generate a data input form for tables in Calc (reproducing the “Data – Form” feature of Microsoft Office Excel), you will need this extension. Then, click on a range or any cell of the newly created table (not on empty cells), and go to Data - Form. That's it. A form will appear letting you insert other records, or edit-delete the old ones. Excellent really. Opensource is the answer. I didn't know that Open Office has add-ons or extensions until now. Thanks for this info and keep up the great job. For me, the speed thing is the issue. Magaling magaling! Suportahan natin ang Free and Open Source Software! WOOT! !